This week The Business of Aging kicks off an amazing series of articles from all over the world, curated by the very talented Jeffrey Rosenfeld, Ph.D. of Parsons School of Design. Join us each week as we highlight innovation from: Israel by Paula Adelman; Singapore by Ani Gregorian; Mumbai by Ushma Mody; and Havana by Steve Minkin. Visitors to the Disney Pavilion embarked on a magical journey to more than 75 nations. Visitors sat four-across in gondolas which each held about 40 people. Together we floated across Disney’s small world, serenaded by a farrago of singing, dancing (robotic) children. Every nation was represented by children in national garb, who were merrily singing “It’s A Small World After All,” in each of their native languages. At the time, it had not dawned on me — and probably on most of the other people in our gondola — that those same nations could just as easily be represented by a chorus of costumed Seniors. Was this ageism, back in 1964? In all fairness, this was a Disney production; and most of the world’s population was still under the age of 20. It’s no wonder that back in 1964, most of us took it for granted that youth was the common experience that made it a small world after all. The social and demographic fact is that aging had not yet taken center stage. 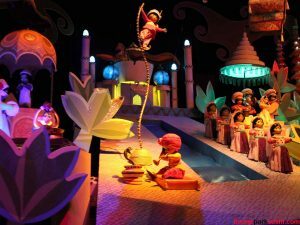 More than 50 years later, the Disney lyric still rings true: It is still very much a small world. But it’s now a world which is “Small” for different reasons. Today, ours is a world knit-together by two Master Trends that are compressing and unifying our social, technological and economic space. These are The Silver Tsunami, and Globalization. It is familiar that the world’s population is now shaped more like a rectangle than a youth-heavy pyramid. And now, more than ever before, the most influential ideas, technologies, products, and services for Seniors have gone global. They flow worldwide, sometimes in a matter of hours. I am reminded, for example, of a Korean client of mine, living not far from Flushing Meadows Park, whose family was looking at ALF’s in Queens. I recall that before they finally settled on one, they forwarded the information to Seoul, so that their Korean advisor could give them feedback. They arrived at a decision within minutes of receiving his email from Seoul. The most intimate and local of decisions had been shaped by our global connections. What better place to celebrate this confluence of Aging and Globalization, than a publication like The Business of Aging? This is a journal whose time has come. It’s the voice of an economic sector that continues to be stimulated by The Age Wave, and energized by globalization. What better way to acknowledge globalization than with a series called Learning from Other Cultures? The symbol of the 1964-1965 World’s Fair was the Unisphere. Even the name underscored that this was one world, and a small one after all. A glance at Figure 2 confirms that the Unisphere celebrated a world without national or political boundaries. The Unisphere was intentionally designed to make that very point. 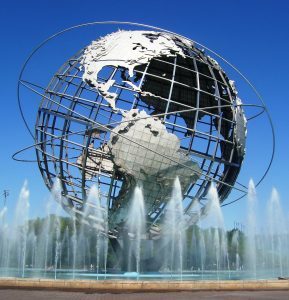 Although it was created for the 1964-1965 World’s Fair, the Unisphere anticipated the impact of the Master-Trends being celebrated here, more than 50 years later: The power of the Silver Tsunami, and the emergence of global markets. It is still a small world, but for very different demographic, economic, and social reasons. Our 21st-Century Unisphere celebrates a world in which national and political boundaries are being eclipsed and reshaped by global forces. The worldwide web, the now ubiquitous http://www , which turns 25 this year. The acceptance of non-Western paradigms, such as Acupuncture, in Western medicine, and germ-theory in non-Western healing. Together, these forces mean that ideas, innovations and products created in one corner of the world, can be available and accessible everywhere. This series, which is called Learning From Other Cultures,will be reporting on products, services and technologies which are very much a product of these global forces, and which promise to transform the lives and social worlds of older people. For example, two of the future installments in this series will focus, respectively, on a Senior-focused food-supplement from Singapore, and a Senior-Friendly mobile phone from India. They, along with innovations described in other installments of the series, are part and parcel of a global economy built upon the needs and desires of older people. Learning From Other Cultures will be an ongoing series. It will showcase the business of aging as it transforms people and cultures worldwide. 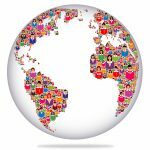 A discussion of worldwide developments in the design of products and services for Seniors; reported by Jeff Rosenfeld. Waiting in the wings, and still in development, are articles on The Business of Aging in Athens, Tokyo, and Buenos Aires. It is still a small world after all.